A midseason Tuesday night game against an Atlantic Hockey Association opponent might, in the big picture of an entire schedule, be one of those games that you could see as a possible letdown. Sandwiched in between two weekends that involve No. 12 University of Michigan and Red Hot Hockey, Tuesday night could have been a game the No. 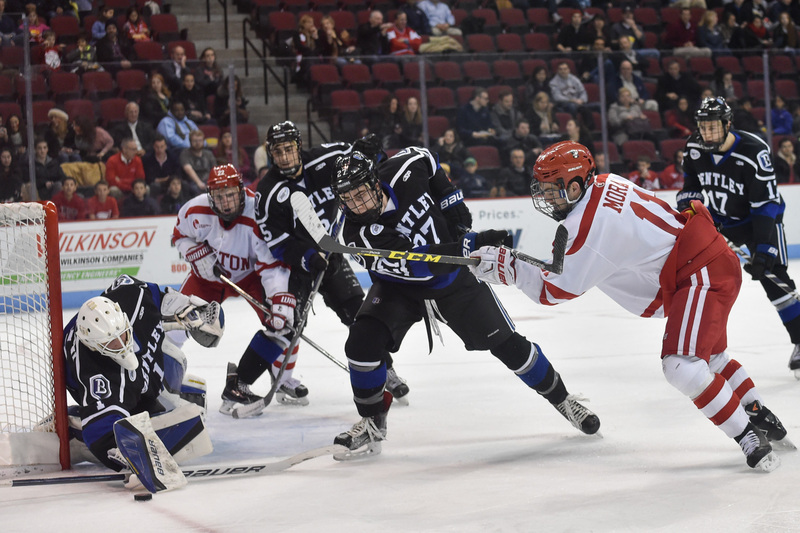 11 Boston University men’s hockey team might have overlooked. But this was not the case for the Terriers (7-4-2, 3-2-2 Hockey East), who defeated Bentley University, 3-0, on Tuesday night at Agganis Arena. From start to finish, BU controlled the pace of play. The Terriers got an early goal from senior assistant captain Danny O’Regan and never let up from there. There was a lot to like in this rebound win for BU, so we’ll breakdown what exactly went right, and wrong, in this weeknight edition of Pluses and Minuses. If you take one quick glance at Tuesday’s scoresheet, you won’t find any of the fourth-line skaters at the top of it for being involved in any goals. So why are we including them as a plus? They didn’t record any points, but the entire fourth line had a consistent effort all three periods that shouldn’t go unrecognized. Moran had a season-high six shots on goal, which all seemed to be in and around the net. He had golden opportunities in the first and third periods, but was robbed by Bentley (5-5-1) goaltender Gabe Antoni each time. He put his head back in frustration after a missed chance of the third, but not all hope was lost for Moran, as he was recognized as the No. 2 star of the game. As for junior winger Tommy Kelley and sophomore forward Chase Phelps, they recorded a combined three shots, but also made smart chip passes into the zone and pressed hard on the forecheck. The senior goaltender hadn’t played in nearly a month, as Quinn continued to ride sophomore goalie Connor LaCouvee over the last seven games. But Maguire got the chance to play against Bentley and made the most of it. It wasn’t as if Bentley peppered him from all angles of the ice, but Maguire was solid when he had to be, finishing the evening with 15 saves and a shutout. His moment of the quiet night came in the third period when he robbed freshman Alexy Solovyev of a would-be goal when he stopped the puck with a combination of his stick and right arm. It was the fifth shutout of Maguire’s college career and first since March 15, 2013 when he blanked Merrimack College in the Hockey East quarterfinals. After a pretty awful showing against Michigan, at least in terms of putting in a “full 60” effort, the Terriers managed to come back together and put forth a consistent effort. In the two games against Michigan, BU totaled 52 shots on goal for the weekend. Against the Falcons, they almost matched that total, with 47 in the game. And in general, BU controlled possession, made better passes and was overall a whole lot less sloppy. Quinn credited his team’s leaders with helping to energize the team, despite the short turnaround. Quinn said there were only about five or six minutes at the beginning of the third period against Bentley where BU might not have played at the same standard of intensity, but overall, it was a lot more consistently pressing from start to finish than either of the Michigan games. We haven’t plugged this on the blog yet, so we figured: Why not now? A few weeks ago we came up with the idea to have some of the hockey players design hand turkeys as part of a small Thanksgiving feature, and it turned out to be absolutely hilarious and awesome to see which players were capable of anything artistic. You can see the end results in the gallery here. We’re really scraping from the bottom of the barrel on this one. Other than the aforementioned five or six less-intense minutes, and maybe a mild criticism of the quality of the shots BU took as the game progressed, there’s really not much to criticize when BU out-attempts its opposition 82-35. If anything major can be criticized, it could be that frankly, this game was, well, boring. It wasn’t anything unexpected, given that it was a. a Tuesday-night matchup b. two days before Thanksgiving c. against a non-conference, non-marquee opponent. But with just 3,475 fans in attendance, the building completely lacked energy. That’s not the lowest attendance at Agganis this season, as that distinction belongs to the University of Denver game on Halloween, where just 3,084 people showed up. But at least that game had a back-and-forth energy, and the building had something to get excited and invested in. Tonight, Agganis was quiet from start to finish. Again, nothing unexpected, and a win is a win. But this was one of the harder games for fans — and us — to stay engaged in, I think it’s fair to say.